Dental emergencies can be of many different forms. They can emerge in the form of a broken tooth, a cracked/chipped tooth, swollen/bleeding gums, etc. Anything can happen at any time, which is precisely why we need to be careful. No amount of regular dental checkups can protect us from emergencies, unfortunately, which is why we need to be exceedingly careful and try our best to avoid such scenarios. That said, when such a scenario does occur, what will you do? This is when emergency dentists come into play. Since they’re available at all times, it is convenient for anyone to just walk into an emergency dental clinic in Los Angeles and to get treatment for their oral problem. And not only that, even if you don’t have dental emergencies but just need to see a dentist during the weekend, they can help you with that as well, since normal dental clinics usually tend to be closed during the weekends. All in all, emergency dentists are a blessing everywhere, as you never know when you or anyone close to you might suffer from dental emergencies that need immediate assistance. Burbank is a city located in the Los Angeles County of South California, with a population of 103,340. This place is crowded, as it is called the world’s “Media Capital”, being only a couple of miles away from Hollywood. 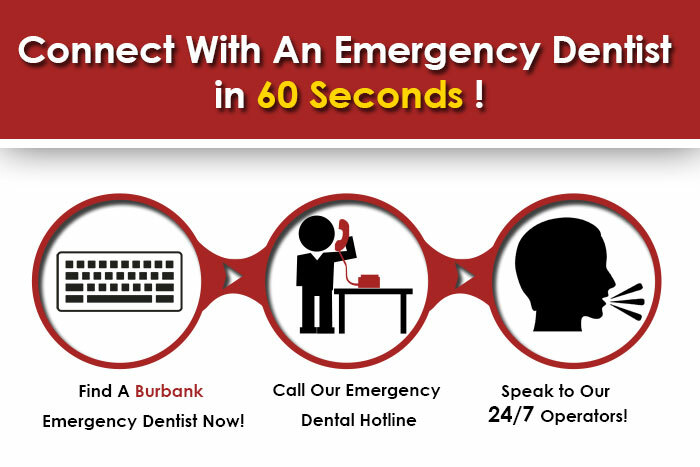 In a city as crowded as such, dental emergencies are nothing new, which is why the citizens of Burbank are lucky, as it contains many qualified emergency dentists to look after all their dental problems. However, it is not enough to have emergency dentists nearby, one needs to know where they are located and what their contact numbers are as well, which is why, they have been listed down below. This dentistry will be more than happy to help you through your dental emergencies. They deal with issues such as knocked out tooth, chipped/broken tooth, objects that are caught between the teeth, and toothaches, as these are dental emergencies that cannot be ignored. If you have an emergency, call them right away, and they will suggest temporary methods that you can try out while you travel to the dentistry. Call them today at (818) 842-7141. This dentistry provides immediate help for your problem. Aside from that, they also provide a whole range of other services, such as cosmetic, general, restorative, and family dentistry, and it also provides oral surgery. The best part of this dentistry is that it’s open on evenings as well as on the weekends, when most other dental clinics are closed. To learn more about them, call them at (818) 593-0700. Open on every day of the week except on Sundays, this dental clinic offers many services, such as teeth whitening, dental crowns, root canals, veneers, etc. If you want to know more about them, contact them at (818) 243-8819. Find an emergency dentist in Santa Monica, California here!